Anti-glomerular basement membrane (GBM) glomerulonephritis is a rare autoimmune disease manifesting as rapidly progressive glomerulonephritis (RPGN) and pulmonary hemorrhage. These are nearly always polyclonal IgG with exceptional cases of polyclonal IgA. Unlike other autoimmune diseases that have waxing and waning disease course, untreated anti-GBM nephritis progresses rapidly to end-stage kidney disease in almost all cases. Timely diagnosis and treatment with plasmapheresis and immunosuppressant medications is of paramount importance to salvage the kidney. 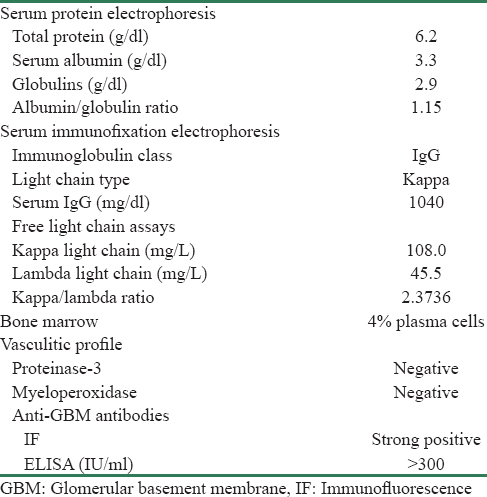 Herein, we present a case having combination of anti-GBM glomerulonephritis and paraproteinemia in the form of circulating monoclonal IgG1-kappa antibodies. A 28-year-old male (weight 70.6 kg) presented with edema, gross painless hematuria, and uremic symptoms since 2 weeks. He was nondiabetic, normotensive, and nonalcoholic. Habit of smoking 2–3 cigarettes/day was there since 2 years. On examination, there was bilateral pitting edema, pallor, and normal blood pressure (130/80 mmHg). Urinalysis showed 3+ protein, plenty of red blood cells (RBCs), and RBC casts. Complete blood count revealed hemoglobin, 10.3 g/dl; total leukocyte count, 14,830 cells/mm 3; and platelets, 2.3 lakhs cells/mm 3. Serum creatinine was 16.5 mg/dl. Serum electrolytes and complements were normal. Total serum calcium was 7.1 mg/dl. Viral markers (hepatitis C virus, hepatitis B surface antigen, human immunodeficiency virus) and antinuclear antibody, antineutrophil cytoplasmic antibody were also negative. Ultrasonogram revealed 12.9 cm kidney size bilaterally with increased echoes. Renal biopsy was performed in view of RPGN. Renal histology showed four glomeruli, all of which possessed circumferential active cellular crescents and fibrinoid material deposition [Figure 1]a. Capillary tufts were nonproliferative but had disruption of capillary basement membranes and Bowman's capsule. Severe acute tubular injury was noticed. There was no giant cell reaction. Immunofluorescence panel (Dako: IgG, IgA, IgM, C3, C1q, kappa, and lambda) showed strong linear uninterrupted staining with IgG (4+ on a scale of 0–4) and kappa (4+ on a scale of 0–4) along glomerular capillary walls (GCW) in all seven glomeruli [Figure 1]b,[Figure 1]c,[Figure 1]d. Rest of the panel was negatively stained. Further subclass of IgG performed showed positive staining with IgG1 (3+ on a scale of 0–4) along GCW and negative for IgG2, IgG3, and IgG4 [Figure 2]a,[Figure 2]b,[Figure 2]c,[Figure 2]d. All seven glomeruli in immunofluorescence core possessed circumferential crescents. Ultrastructure of kidney retrieved from paraffin block did not show any powdery or electron-dense deposits in glomeruli and tubular basement membranes. A diagnosis of anti-GBM crescentic glomerulonephritis with monoclonality (IgG1-kappa light chain restriction) was made. Further detailed post-biopsy serum investigations are shown in [Table 1]. The patient was treated with intravenous (IV) methyl prednisolone 500 mg, 1 dose of cyclophosphamide 500 mg, and subsequently switched to oral steroids 1 mg/kg/day. Eight sessions of plasmapheresis were performed in addition to regular hemodialysis. Targeted therapy including bortezomib-based regimen was discussed with patient attendants, but they were hesitant due to financial constraints and the patient was lost to follow-up. Crescentic glomerulonephritis is the morphologic counterpart of RPGN. Glomerular histology is characterized by active crescents. IgG staining along capillary walls is pathognomonic of anti-GBM nephritis, which is often polyclonal. A differential diagnosis of heavy/light deposit disease in a crescentic transformation is a remote theoretical possibility if one of the light chains is found to be restricted. Lack of powdery deposits in ultrastructure excludes the latter. Autoantibodies are usually polyclonal in nature, directed against NC1 domain of α3 chain and α5 chain of type IV collagen. Rarely, these antibodies are monoclonal with/without circulating antibodies. Savige et al. have described lambda light chain-mediated anti-GBM disease in a 77-year-old male. Similarly, there are anecdotal case reports of circulating monoclonal IgA-kappa antibodies causing severe renal failure and crescentic glomerulonephritis, monoclonal gammopathy of undetermined significance and Waldenstrom's macroglobulinemia,, and recurrence in allograft., Our case is the first report demonstrating circulating IgG1-kappa monoclonal antibodies and anti-GBM crescentic glomerulonephritis with linear staining for monoclonal IgG1-kappa light chain restriction. Smoking, one of the known risk factors associated with autoantibody production, was noticed in this patient. Coley et al. have recently described a patient with monoclonal IgG1-kappa anti-GBM antibody-related glomerulonephritis without a circulating antibody despite repeat testing by multiplex bead assay. Renal histology was that of diffuse endocapillary and exudative glomerulonephritis without crescents in twenty glomeruli sampled on first instance. Myeloma workup including serum and urine paraprotein, bone marrow biopsy, and serum-free light chain ratio were normal. He was treated with immunosuppressant drugs and had an indolent clinical course. An indicated repeat biopsy 9 years later demonstrated similar histology with solitary fibrocellular crescent and progressive glomerulosclerosis/tubulointerstitial scarring. In contrast to this, our patient had aggressive presentation, 100% active circumferential crescents at the outset, demonstrable paraprotein in the serum, and altered serum-free light chain assay. Bone marrow in our case is similar to those described in previous cases of monoclonal anti-GBM nephritis.,,,,, The percentages of plasma cells were within the normal range (<10% plasma cells). In the scenario of focal crescents, it is very important to remember passive adsorption of IgG linear staining as highlighted by Coley et al. We can definitely exclude this possibility in our case by virtue of serum paraprotein and more importantly positive linear pattern for >1 antisera (IgG, IgG1, and kappa). Spectrum of glomerular lesions associated with PCD includes MIDD, AL/AH amyloidosis, cryoglobulinemic glomerulonephritis, immunotactoid glomerulonephritis, and crystalloid glomerulopathy.,, However, production of monoclonal anti-GBM antibodies causing destruction of GBMs with crescentic transformation is rarely described. One would argue that our patient had two diseases simultaneously. Kappa light chain restriction in immunofluorescence was useful, and a common link between two diseases postulating causative factor. In summary, we report an aggressive case of circulating monoclonal antibodies causing anti-GBM crescentic glomerulonephritis, adding to the expanding spectrum of glomerular lesions associated with PCD. We sincerely thank Mrs. Tulasi Kumari, Mrs. Hema Nagaraj, and Mrs. Bindu for their outstanding technical support in histopathology section. Fischer EG, Lager DJ. 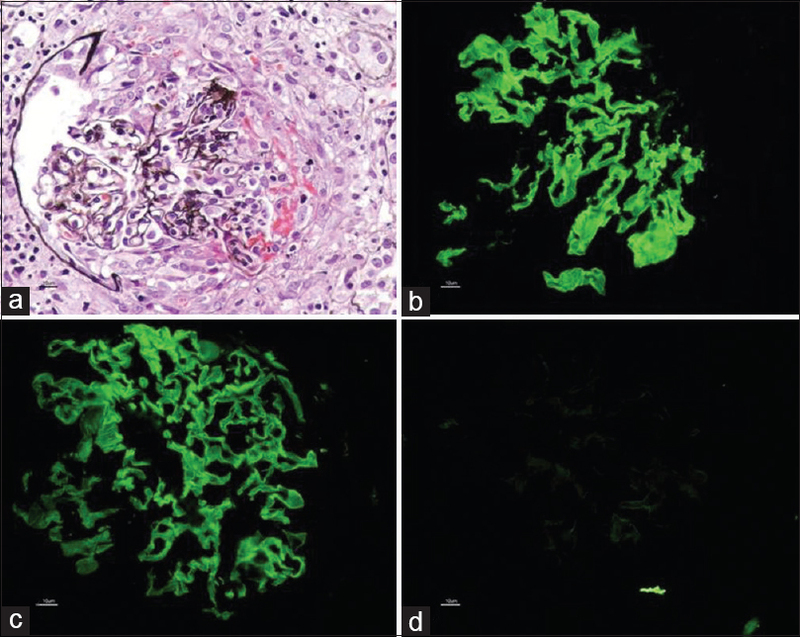 Anti-glomerular basement membrane glomerulonephritis: A morphologic study of 80 cases. Am J Clin Pathol 2006;125:445-50. Herrera GA. Renal lesions associated with plasma cell dyscrasias: Practical approach to diagnosis, new concepts, and challenges. Arch Pathol Lab Med 2009;133:249-67. Nasr SH, Satoskar A, Markowitz GS, Valeri AM, Appel GB, Stokes MB, et al. Proliferative glomerulonephritis with monoclonal IgG deposits. J Am Soc Nephrol 2009;20:2055-64. Savige JA, Yeung SP, Bierre AR, Kincaid-Smith P. Lambda-light-chain-mediated anti-GBM disease. Nephron 1989;52:144-8. Maes B, Vanwalleghem J, Kuypers D, Van Damme B, Waer M, Vanrenterghem Y. IgA antiglomerular basement membrane disease associated with bronchial carcinoma and monoclonal gammopathy. Am J Kidney Dis 1999;33:E3. Gandhi S, Little MA, Farrington K. Waldenstrom's macroglobulinemia presenting as Goodpasture's syndrome. Ren Fail 2004;26:591-6. Borza DB, Chedid MF, Colon S, Lager DJ, Leung N, Fervenza FC. 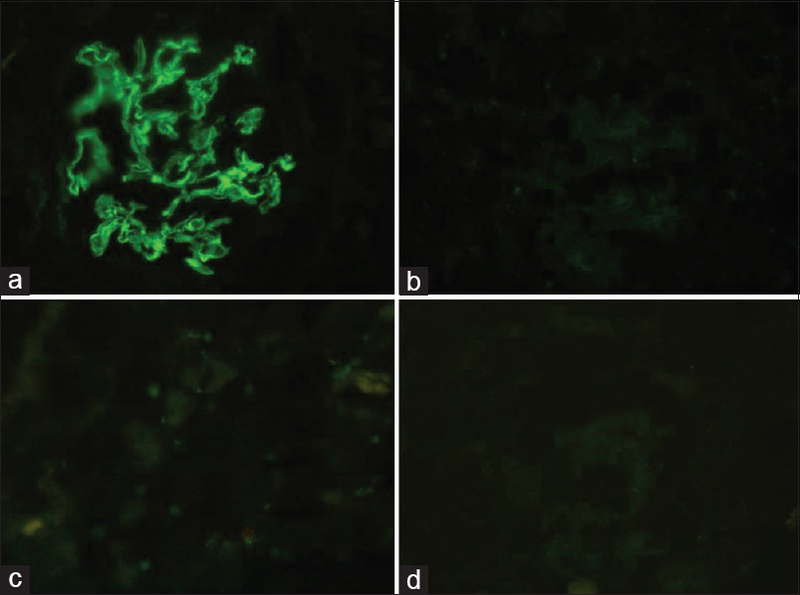 Recurrent Goodpasture's disease secondary to a monoclonal IgA1-kappa antibody autoreactive with the alpha1/alpha2 chains of type IV collagen. Am J Kidney Dis 2005;45:397-406. Fervenza FC, Terreros D, Boutaud A, Hudson BG, Williams RA Jr., Donadio JV Jr., et al. Recurrent Goodpasture's disease due to a monoclonal IgA-kappa circulating antibody. Am J Kidney Dis 1999;34:549-55. Coley SM, Shirazian S, Radhakrishnan J, D'Agati VD. Monoclonal IgG1κ anti-glomerular basement membrane disease: A case report. Am J Kidney Dis 2015;65:322-6.